Forming the culmination of the 25th Anniversary celebrations of Les Misérables was a pair of concert versions of the show taking place at the O2 centre in Greenwich which brought together the company of companies, over 500 actors and musicians joining forces to pay tribute to this enduing classic of a show. 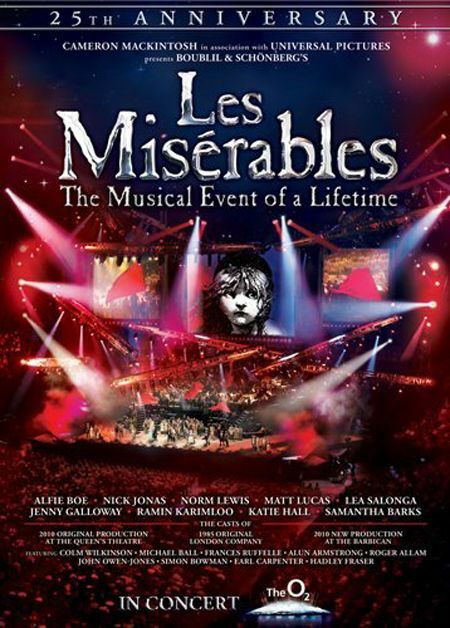 The cast and companies of the touring production and the West End production joined with a massive choir and orchestra and a hand-picked international cast performed the lead roles in this concert presentation which was also relayed live into cinemas and later released on DVD to be enjoyed by those who chose not to go (or couldn’t get tickets). Concert versions of shows are always a bit funny, performers singing songs to each other but looking straight out at audiences and limited opportunity for acting so they can often feel a little constrained in their presentation. Here, the cast were in full costume and projections and clips from the show used to fill in some of the gaps that the songs could not fill. And it is all really rather good if not quite the self-proclaimed “musical event of a lifetime”. Conductor David Charles Abell marshals his orchestra into fine shape with the sparkling new orchestrated score and co-directors Laurence Connor and James Powell assembled a mountain of talent to create a real spectacle. The choir sat at the back look a little like sad groupies in their t-shirts close up, but the panoramic view reveals they create a grand tricolore effect which with the simple staging and evocative lighting all combined to great effect. Performance-wise, Matt Lucas and Jenny Galloway made a raucous pair of Thénardiers, Norm Lewis’ Javert was a finely calibrated performance of a man dominated by his warped moral code and Lea Salonga’s Fantine was simply gorgeous: clear-voiced, impassioned and unfussy. I’ve always been team Éponine/Enjolras rather than Cosette/Marius, they are just so much more interesting personalities and I was particularly impressed with Samantha Barks and Ramin Karimloo as the former pair. Katie Hall did fine as Cosette but I dislike the character so much there’s little that can be done for me and Nick Jonas, a controversial choice as Marius to be sure, is pretty much out of his depth here: sweet-voiced but unable to match up the seasoned performers around him and far too reliant on his permanently furrowed brow to convey emotion. Which then leads me onto Alfie Boe as Jean Valjean. I’ve never been a guy for male operatic voices, they just don’t really do it for me, and Boe falls squarely into that category. His performance is all about the voice, and though there’s little opportunity to act, he doesn’t seem to make any effort to really connect with anyone around him or the grander narrative that is at play here, indeed he looks like a rabbit in the headlights more often than not. What really bugged me though was his breaking of the fourth wall during the applause from ‘Bring Him Home’, he was the only performer to acknowledge the (admittedly considerable) audience reaction, something which felt arrogant and self-indulgent given the quality of the performances of the whole ensemble both before and after him who didn’t feel the need to milk it though they could well have done. So a great way to mark an anniversary: the riches in the ensemble meant that there was some nice luxury casting in the minor roles, Hadley Fraser’s Grantaire and Earl Carpenter’s Bishop being two fine examples and altogether, the impact of this presentation made it something really enjoyable to watch.